Well, if not, you should be hopping along (I'll tell you why in a moment). There are some really wonderful birthday ideas from all of us on the design team...and including Julie's two girls, who are also having fun celebrating their aunt's birthday. Here's my card in celebration her special year! I used blue crinkle ribbon from the newly released Red,White,Blue Bundle. It's such a nice shade of blue! The white has bits of the red and blue in it (and I love the ribbon when it's like that)...and the red is also pretty awesome...like marachino cherries. The little button in the center is from Pinque Peacock (love lady bugs!) and everything else is Stampin Up! 3GirlJAM is spreading the fun all around with a 20% discount (with >$10 purchase) through Sunday, so we can all get a little present! Also, and this is the best part....there are a few of us in the hop that get to give some lucky person a Gift Certificate for free goodies. Guess who is one of them? Yes, that's right...ME! (1) Comment on everyone's stop. Simple, right? I will pick a winner and post the result here on Monday morning! Now, tell me something you like to do for your birthday in the comment section below! This is so beautiful. The 3GJ ribbon is a perfect match. I especially like the mixed papers and the diamond. TFS. I love the fact that I don't have to cook on my birthday!!! Beautiful card!! Love the color combo! Great card - Love that lady bug so much! For my birthday, I usually just chill. As long as I don't have to do the dishes, I'm happy! I like 3GJ on their blog, the challenge blog and FB! Love your FUN birthday card! Fabulous bright and cheerful papers:) Lovin that ribbon! Soooooo cute!!!! I'm falling in love with this ribbon! Well, since u bring up birthday, my birthday is coming up and were having a hop for me as well!! Would love for you to come by and check it out! 6/22/13!!! What a cute card! I love the little ladybug! I like to spend my birthday with my husband and son, then go to dinner. 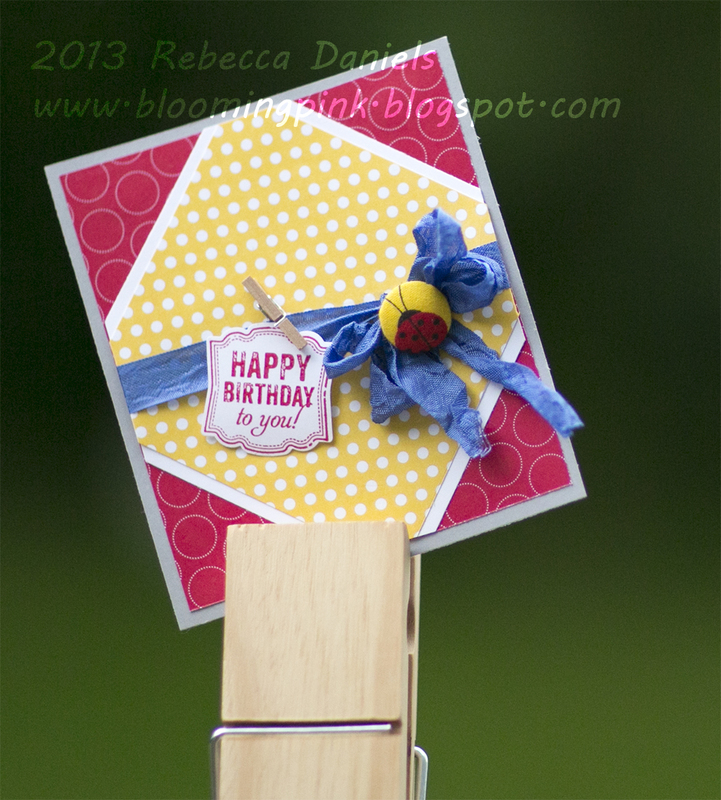 The color combinations on this card and the yellow polka dots ... very neat! For my July birthday I like to be on the water taking a cruise and jumping in when it's time to cool off. P.S. I wanna go to Disney World for my bday. It's in Dec, so I would get to see Mickey's Christmas. I <3 DW. What a cute Birthday Card. Really nice. Such a cute card! I hadn't thought to use the little clothespins on a card! I just love relaxing with my little family, maybe going out to dinner for my birthday. what a fun card! Love the ladybug button and the little wood peg! That ladybug is fantastic! (love the big clip you used to photo it with, too). Another great 'Bek' project - I'd expect no less! Oh, my birthday thought -- my birthday falls on a Saturday this year, so I won't have to work on it, although working in the nursing home on my birthday is actually loads of fun. I get birthday hugs all day and told how young I look -- great for the ego. This year, I'm hoping to go for a long motorcycle ride on my day. On My Bday I Would Love To Have Date Night With Hubby .. Don't Have Many Of Those ..
Love your card! I am a fan of lady bigs! I like to go out to eat for my bd. I also like to have my favorite cake, white cake with butter creme frosting. I love your card! What a neat idea to use a clothes pin to take a picture of it! I like to watch a movie and have cake/ice cream with family on my birthday! Great card love the colors and the ribbon is fantastic. I clicked on the link to facebook but it brought me to barns and noble.. I love barns and noble but not what I wanted at the time. I will find the ink on one of the blog pages. Cute Card...I love to go to Casa De Pico restaurant and have my favorite fried ice cream! Yummy! Have to have it every year! Adorable card!! Love the colors! For my bday I like to hang out with family and friends. such a fun card. Love that lady bug button! such a great birthday card! LOVE the color combo and card LO!! I love your card, it's so cute!!! I love the little clothes pin!! Thanks for sharing.... I already liked 3GirlJam on facebook. I love spending my birthday with my mom.... it's only fitting since she did all the work to bring me into the world. I love the fun colors and button with the ribbon. I also love spending birthdays with family. For my birthday, I like to take the day off of work!!! I like to go out to breakfast or lunch with friends or my daughters. I like to craft. Then, usually, we go out for dinner, since I really don't want to cook!!!! Gorgeous!! I love all these bright colors! Awesome job! Love this little lady, Rebecca! Such a bright and happy card my talented friend! I already love 3GJ on FB and for my birthday what I love to do most is spend the day with my family AT THE BEACH! love the ladybug button, too cute!! Beautiful card! Pinque Peacock June Blog Hop!